Yesterday, I posted a kettlebell workout. Did you try it? If you don't have access to kettlebells, then you probably didn't. And you probably won't. 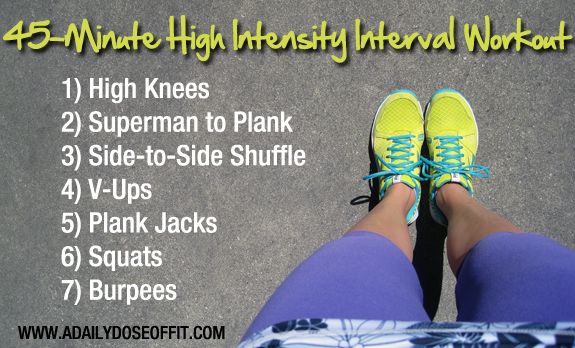 So today, just for you, I've put together a 45-minute high intensity interval workout that doesn't require any equipment (as long as you can find a soft place to lie down, otherwise you'll need a mat). Directions: The idea is to push yourself. Remember, everyone's high intensity is a little different. Do each exercise for 30 seconds with a 10-second break in between. Repeat the entire circuit five times. Of course, you'll need to warm up first. And stretch when you're done. Got water? Sip frequently. Oh, and don't forget to enjoy the journey. Always enjoy the workout journey. Now, if you'll excuse me, I seriously need to finish packing for BlogHer! Question: What is your favorite piece of workout equipment?